It seemed like we were going get through this winter without any snow, but then we received a few inches about a week ago. Unfortunately the following days we didn't get any sunshine, and the plain grey skies put me off going out to photograph the snow covered landscape. The snow started to melt fairly quickly as well, but before it was all gone we got another couple of inches on Thursday night. On Friday we actually had a nice sunny day, so I went out for a walk and took some panoramas. I am still taking 'normal' still photographs as well as panoramas. But I am just putting my priority on processing the panoramas at the moment, so the normal shots will have to wait. In the pano above you can see there are a few tracks going off the road, I would guess where cars slipped off the road. One of them is in a circle, I reckon that they slipped off the road then decided to turn round and go back home. 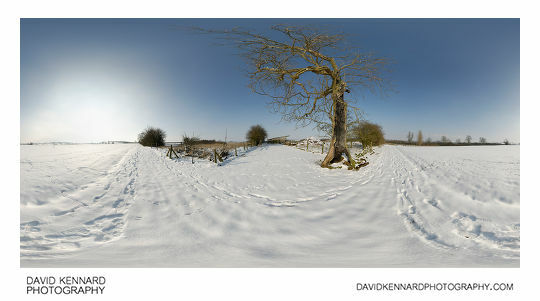 You can see the 360VR version at Lubenham to East Farndon Road in the snow 360 VR. The above pano was taken at the gateway between two fields. 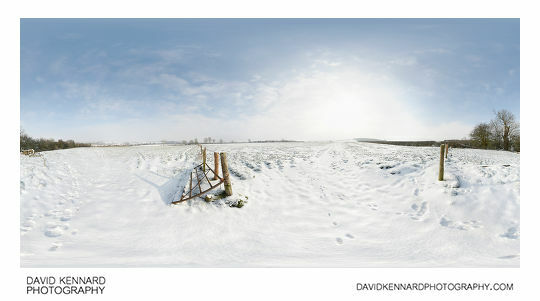 The 360VR version is Gate between snow covered fields near East Farndon 360 VR. You can see there are lots of rabbit tracks in the snow. I didn't see any rabbits all the time I was out, so I think they must have been out early in the morning, then spent the rest of the day in their burrows. Carrying on, I came across this rusty old bathtub, which is probably used as a drinking trough for cattle. 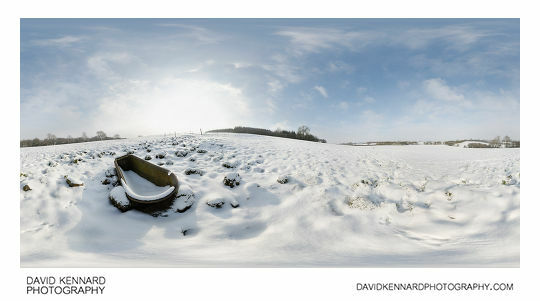 (360VR version: Bathtub in snowy field near East Farndon 360 VR). I didn't see any cattle or cattle footprints on the whole walk. I think the farmer had sensibly moved them all into a barn. For taking these snowy panoramas, I would set my tripod up and level it. I had a hotshoe bubble level I used to help with this. Unfortunately I think it fell out of the camera's hotshoe when I was walking home. I've just ordered a replacement off ebay, so I'll hopefully remember to remove the new one from the hotshoe after using it. After setting up the tripod I would take bracketed test shot(s) to check the exposure was okay. Then I pointed the camera down (on the tripod) to take the nadir shot. As you take the around shots, you have to move around the tripod to keep out of the shots. This often results in a ring of footprints around the tripod. I wanted to avoid capturing this, which is why I took the nadir image first. Then I would take the around shots, the zenith (up) shot, and a handheld nadir shot. When processing the panoramas, I cloned out the holes in the snow left by the tripod legs. 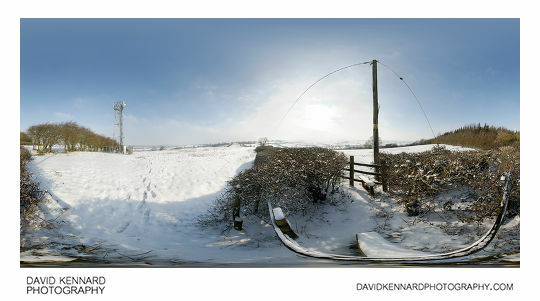 360VR version: Hill NW of East Farndon in the snow 360 VR. 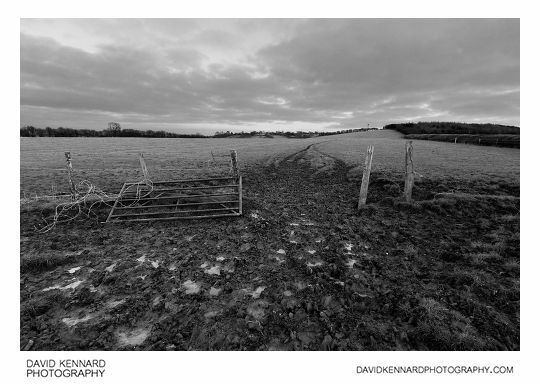 For the pano above I extended the tripod legs to their maximum length, and positioned it above the stile / fence. I was debating about whether to take the panorama here, or by the communications tower. I decided to do it here as lets you see the fields on both sides of the hedge. I already have an older (non snowy) panorama taken by the communications tower anyway. 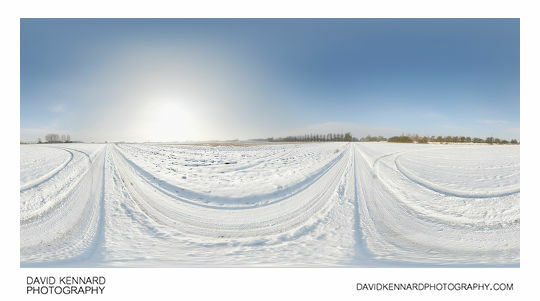 360VR version: Snowy field between East Farndon & Lubenham 360 VR. As I passed this tree I thought it might make a nice subject to come back to for a sunset panorama. But then I thought that actually it looked nice now, so I took the panorama then instead of waiting until sunset. As it happened, the sun set behind a large cloud bank, so there wasn't much of a sunset anyway. Just behind the tree is a pile of manure. Quite a bit of it was free of snow, and there must have about 20 Robins eating insects from it. There were also a few Blackbirds and Dunnocks. I did try taking photos of them, but my 100mm macro lens just wasn't long enough. I stayed still for quite a long time, hoping that one would land on the post next to where I was standing, but no luck. It was nice just watching them though. Maybe a pile of manure would be a good thing to have in your garden. Must be a lot cheaper than all the sultanas and mealworms the birds seem to get through so quickly. The day after I took the above panos, we had a lovely hoar frost. The weather was also better (less haze in front of the sun). I did think about going out again and taking some more panos, but then decided against it. The frost had already started melting by about 8.30am, so I thought I'd be better off processing the panos I'd already taken than taking some more of trees covered in half melted hoar frost.